Illustrations note 79 Illustrations, black and white; XV, 346 p. 79 illus. The logical systems presented are: propositional logic, first-order logic, resolution and its application to logic programming, Hoare logic for the verification of sequential programs, and linear temporal logic for the verification of concurrent programs. There are 150 exercises with answers available to qualified instructors. Mordechai (Moti) Ben-Ari is with the Department of Science Teaching at the Weizmann Institute of Science. He is a Distinguished Educator of the ACM and has received the ACM/SIGCSE Award for Outstanding Contributions to Computer Science Education. His other textbooks published by Springer are: Ada for Software Engineers (Second Edition) and Principles of the Spin Model Checker. 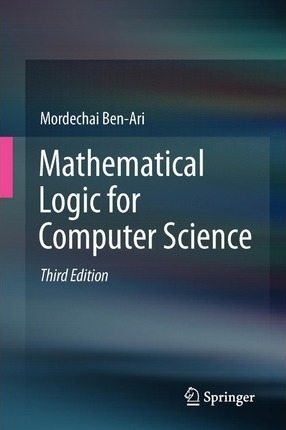 Preface.- Introduction.- Propositional Logic: Formulas, Models, Tableaux.- Propositional Logic: Deductive Systems.- Propositional Logic: Resolution.- Propositional Logic: Binary Decision Diagrams.- Propositional Logic: SAT Solvers.- First-Order Logic: Formulas, Models, Tableaux.- First-Order Logic: Deductive Systems.- First-Order Logic: Terms and Normal Forms.- First-Order Logic: Resolution.- First-Order Logic: Logic Programming.- First-Order Logic: Undecidability and Model Theory.- Temporal Logic: Formulas, Models, Tableaux.- Temporal Logic: A Deductive System.- Verification of Sequential Programs.- Verification of Concurrent Programs.- Set Theory.- Index of Symbols.- Index of Names.- Subject Index.